Just a month ago I predicted that the 2019 NRL premier would come from the usual suspects, with my tip being the Roosters to be the first side to go back to back since the Broncos in 1992-1993. Now, after just one round has been played, the stats show just who is really likely to be there when the whips are cracking and just who will be getting the spoon. And the stats are surprisingly compelling. Let’s look at who will be this year’s likely wooden spooner first. First up, you get a good guide to who’ll come last each year by looking at how sides placed the previous season. *While the Storm were officially last in 2010, the Cowboys had the fewest wins. **While the Bulldogs were officially last in 2002, the Rabbitohs had the fewest wins. What observations can we make from this? Nine of the 21 spoons on offer have been won by just three clubs (42.8 per cent). That number increases to ten if you factor in that the Rabbitohs had the fewest wins in 2002. Five times the winners of the spoon won it the previous season (23.8 per cent). So almost a quarter of the time the previous year’s spooner has got more cutlery. On only six occasions have sides that made the finals the previous season won the wooden spoon (30 per cent). None of those sides were ranked above fourth place at the end of the home-and-away season. In total, 14 of the 20 times the eventual spooner was not in the previous year’s finals series (70 per cent). Eight times the wooden spooner finished in the bottom four the previous season (40 per cent). So what can we extrapolate from this? In total, 19 of the 21 wooden spooners lost in first round, with 11 of those losses by 13+ (53 per cent). In the two aberration wins that occurred, on both occasions the side was at home and playing a non-finalist from the previous year (the Warriors in both instances). To summarise, the 2019 wooden spooner will most likely not have finished the 2018 home-and-away season in the top three spots on the ladder (Roosters, Storm and Rabbitohs). Most likely they will have lost in Round 1 and will have not made the finals in 2018 (Bulldogs, Sea Eagles, Titans). So, according to the trends on display, while the Bulldogs and Sea Eagles are also a good chance, the Gold Coast Titans are the most likely side to win the wooden spoon in 2018. So who do the tea leaves left after Round 1 indicate will be the 2019 NRL premiers? What we draw from this is that 52.4 per cent of the time the eventual premier has lost in the first round, but on only three occasions has a side lost their first two games and gone on to win the premiership (14.3 per cent). The Cowboys are the only side to have lost their first three matches and go on to premiership glory that season in the last four decades. So all is not lost for the Roosters, Broncos, Sharks, Dragons or Panthers. The stats show that if they get a win this weekend there is no need to panic – yet. However, we can narrow down the likely premiers a bit more using the following stats. 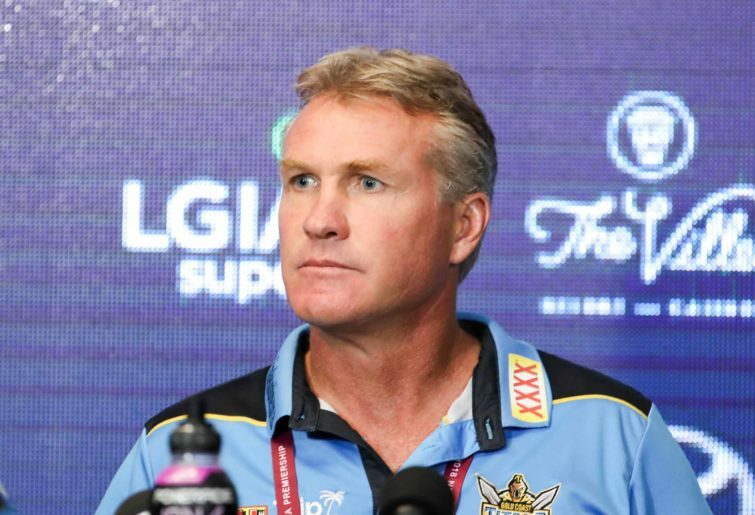 Only four times (19 per cent) in the NRL era has the premier not recently played in a GF or preliminary final: Sharks 2016, Cowboys 2015, Wests Tigers 2005 and Panthers 2003. 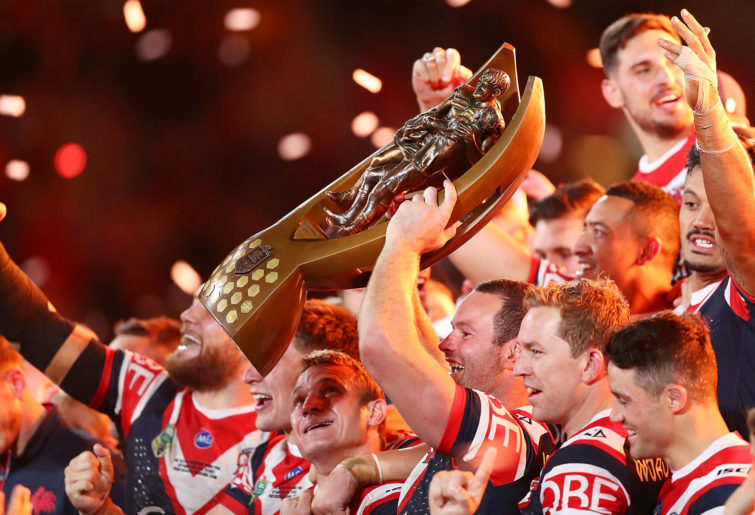 On only three occasions (14.3 per cent) was the premier not in the finals the previous year: Panthers 2003, Wests Tigers 2005 and Roosters 2013. Only five of the eventual premiers (24 per cent) had 13+ wins first up: Broncos 1998 = 16 points, Storm 1999 = 22 points, Roosters 2002 = 34 points, Bulldogs 2004 = 34 points and the Rabbitohs 2014 = 20 points. History shows us that the top eight changes by only two or three sides each year, with at least five sides returning for September action from the previous season. As always, there are a few outliers for the eventual premiers in the stats. In 2002 the Roosters won their first round match and then lost four straight. In 2014 the Rabbitohs won their first game and then lost three straight, and the 2005 Wests Tigers had never played finals football before. However, our likely premier in 2019 will have the following characteristics. They are likely to have played in last year’s finals (Roosters, Storm, Rabbitohs, Sharks, Penrith, Broncos, Dragons, Warriors). They may not have won big or even won last weekend – but if they didn’t win then they must win this weekend, which puts big pressure on: the Dragons to beat the Rabbitohs, the Broncos to beat the Cowboys, the Sharks to beat the Titans, the Roosters to beat the Sea Eagles and the Panthers to beat the Knights. However, right now with a first up win under their belts, it is the Storm, Rabbitohs and Raiders that are the best placed sides historically to win the 2019 NRL premiership. Given that the Storm have played in nine of the 21 NRL grand finals so far – and seeing how well they played last weekend – it is hard to go past the Purple Horde this year. However, we await the results from Round 2 to really narrow the field. Tim has been an NRL statistician for ABC Radio Grandstand since 1999, primarily as part of their Canberra coverage. Tim has loved rugby league since Sterlo was a kid with lots of hair but was cursed with having no personal sporting ability whatsoever. He couldn't take a hit in footy, was a third division soccer player making up numbers, plays off 41 in golf and is possibly the world's worst cricketer ever. He has always been good at arguing the point though and he has a great memory of what happened.